On Sunday afternoon, the “Can Do” kids all gathered at the “Can Do” Street Community Center for the annual egg hunt, and the awarding of the chocolate bunny for the most eggs collected. With the blowing of a whistle, the “Can Dos” all set out to find the colored eggs hidden in the field behind the community center. They all carried baskets to hold the eggs they found. There was to be a prize for the most eggs found. The prize…a huge chocolate bunny that was the exact image of what the Easter Bunny was thought to look like. There was so much excitement! The “Can Dos” were running and looking all over the place! Soon there were no more eggs to be found and the “Can Dos” carried their baskets into the recreation room to join their parents for refreshments and the awarding of the prize for most eggs. Members of the Seniors club served individual bunny cakes and orange-flavored bunny punch. Everyone pretended the bunny punch was carrot juice since rabbits love carrots! Silence fell over the room. The “Can Dos” just wanted to know who won. The suspense was too much! Hector couldn’t help wishing that somebody would tell Miss Hattie what she wanted to hear so she would get on with awarding the chocolate Easter Bunny. Orrie cleared his throat and began talking. “Long ago, thousands of years ago during pagan times, there were special things to do to welcome spring. The rabbit and eggs were symbols at these spring celebrations. In the 1600’s Germans began to write about a rabbit they called Oschter Haws. He was a rabbit that was believed to have the ability to lay colored eggs that were given as gifts to good children. Orrie stopped talking and the room broke into applause. Orrie’s family beamed with pride at their smart boy! Well, the eggs were counted and the winner announced. Eulyn collected the most eggs…fifty-six to be exact. Miss Hattie handed her the bunny. Why it was almost as big as she was! Then Eulyn did a really special thing. She walked over to the “Can Do” Kids table and invited each “Can Do” to break off and eat a piece of the chocolate Easter Bunny. Now that’s a girl who knows how to share! Bobby is excited about visiting another class in school. He asks his teacher if the are going to Mary’s class. Miss Pat, his teacher, reminds him that we do not call teachers by their first name. Out of respect, what does Bobby need to call Mary, the teacher his class is going to visit? Bobby plays sports. He has a coach named Ned. What should he call him? Can you think of an other adults you call by a special name like aunt? All over “Can Do” Street parents were reviewing report cards as “Can Do” kids stood anxiously by waiting to hear what their parents had to say. While Orrie, Arthur Jay, Yundi, Wendy, Eulyn, and Annie didn’t have anything to worry about, others had some real worries. Hector, Willie, and Jay got lower grades in reading and writing than they did on their last report cards. Kathy, did well in her grades for academic subjects, but didn’t do so well in the grades she got for classroom behavior. Kathy was still falling asleep in class, some days, because she didn’t eat breakfast and ran out of energy about 10 AM. Bobby also got an unsatisfactory in classroom behavior for not paying attention when Miss Pat was teaching, and for bothering others when they were trying to pay attention. Nellie’s problem, well, she has a hard time sharing supplies when she works on a project with others. The next day, the class was unusually quiet. Those that didn’t do so well on their report cards were thinking about what their parents had to say, and they were worrying about what Miss Pat was going to say to their parents at the parent teacher meeting that night. Miss Pat cleared her throat and everyone looked up from the match assignment they were doing. Nellie raised her hand and asked,”What if your problem is not with the subjects, but about behaving in class?” A few of the “Can Dos” nodded their heads, as if they had the same question about their report cards. Miss Pat let that thought sink in for a while. She handed out some coloring pages to give the “Can Dos” a break from all their worrying. Then she called each one of the “Can Do” kids who had a problem up to her desk to meet with her privately. She offered those with problems with reading and writing after school tutoring to help them catch up with the rest of the class. Kathy promised to participate in the school breakfast program at school, or carry an energy bar to school, eating it on the way, or getting up earlier to eat breakfast at home. 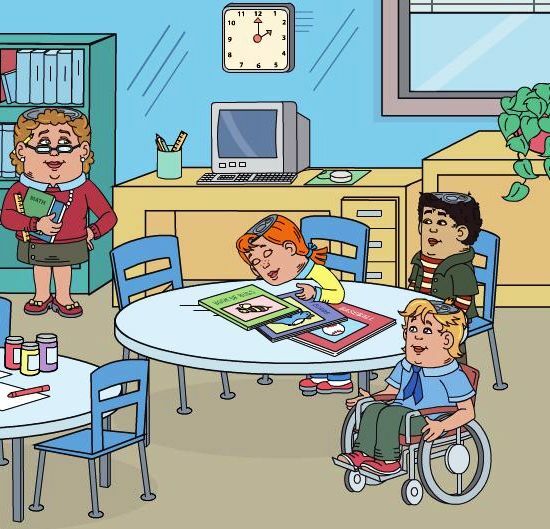 Miss Pat gave Bobby a choice of either moving his seat away from his other classmates, so he wouldn’t bother them while they were trying to listen to Miss Pat teaching, or staying where he was and working on paying attention and allowing others to pay attention. He asked to be allowed to stay where he was, promising to pay attention. Nellie was not sure what she should do to get better at sharing. Miss Pat suggests that Nellie allow others to take their share of the group supplies before she takes her share. Then Nellie came up with an idea, every day she would share at least one thing…a cookie, note paper, a pencil, crayons.